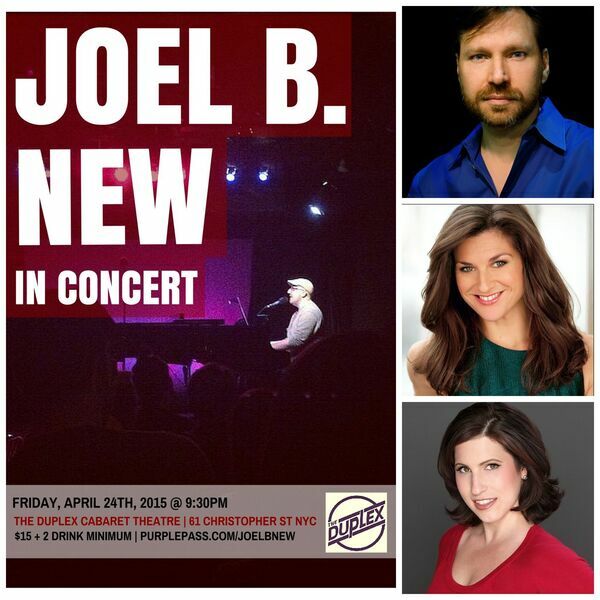 In anticipation of his own upcoming solo concert debut, award-winning musical theatre writer Joel B. New sat down with three respected artists in the cabaret world to ask them about the impetus for getting into cabaret, what they’ve learned, and what inspires them. Nikki MacCallum is an actress, writer, and cabaret artist living in New York City. She’s originally from the Boston area and holds a BM from NYU. As a cabaret artist she’s performed at venues throughout NYC including 54 Below, The Metropolitan Room and Lincoln Center. Last fall, Nikki was a featured artist at Birdland along side Donna McKechnie and Jerry Mitchell. She recently attended the Eugene O’Neill Cabaret Conference directed by John McDaniel where she started developing “Familiar Things,” her most recent cabaret, which earned her second MAC nomination. Melanie Kann earned her BFA in Drama at NYU'S Tisch School of the Arts where she concentrated in Musical Theatre at CAP 21 Conservatory, and also double majored in Broadcast Journalism. When she isn't singing a showtune, odds are she is either out running an inappropriate amount of miles in prep for her next marathon, coaching young runners with Run4Fun youth running club, or slingin' sneakers at Jack Rabbit Sports in Park Slope. Her show “Songs for Square Pegs” just enjoyed its second incarnation at the Metropolitan Room. A jack-of-all trades theatre person, Thomas Honeck built sets for HBO, earned his Equity card playing Harry McAfee in “Bye, Bye Birdie, " designed lights for various theatres throughout the city, taught at the Yale Cabaret Conference, and toured the country with The Teenage Mutant Ninja Turtles. Thomas made his cabaret debut in 2004 with “Going On Faith… ” for which he was nominated for a MAC Award. He won two years later for his follow-up show “Dreaming Wide Awake.” Thomas has been an integral part at the Duplex for 19 years and has been the proud Program Director for its Cabaret Theatre since 2006. He has recently collaborated with his creative partner & director, Lisa Moss, on their 3rd show together, “Dancing With Death,” which can be seen at the Duplex on May 27th & July 12th at 7pm. All proceeds go to the ALS Association and JDRF (Juvenile Diabetes Research Foundation). For the song portion of the episode, Joel performs "Somebody Else" at Actoria In The Astor Room, a new weekly musical theatre series in Astoria Queens, created by Josh Bardier and David Bryant Johnson. "Joel B. New In Concert" is on Friday, April 24th at 9:30PM at the Duplex Cabaret Theatre in New York. Directed by Justin Daniel. Tickets are $12 in advance ($15 at the door) plus a 2-drink minimum. To purchase tickets, visit purplepass.com/joelbnew.